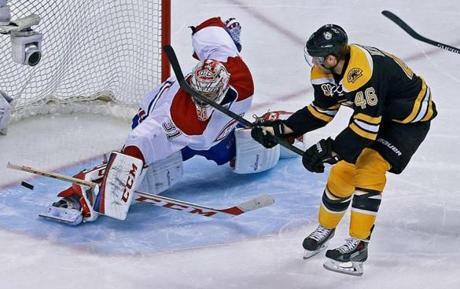 The Bruins went home disappointed on Thursday after losing Game 1 of the series with Montreal 4-3 in two overtimes. 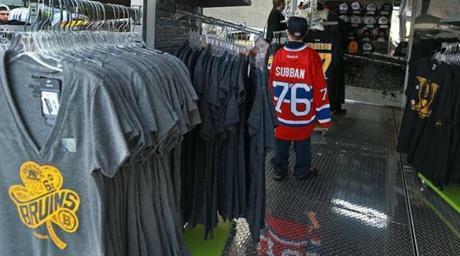 Before the game at the Bruins pro shop outside TD Garden, a young fan wearing a Canadiens P. K. Subban sweater shopped among the Bruins merchandise. The team mascot and some dancers hung out on the roof as fans arrived for the game. 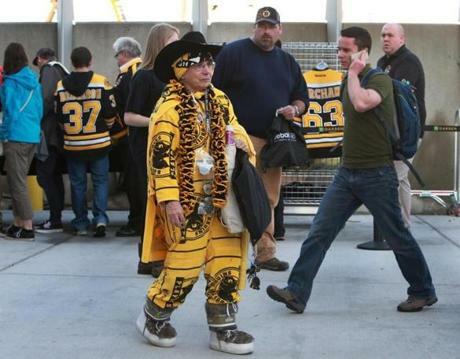 Paula Mattaliano of Arlington was dressed for the occasion. 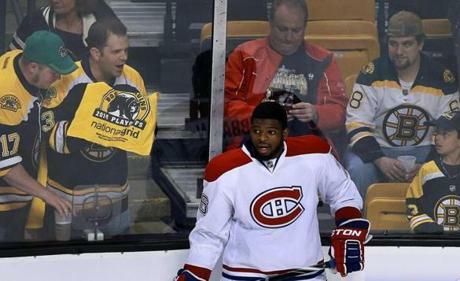 Bruins fans taunt Montreal's P. K. Subban during warm-ups. 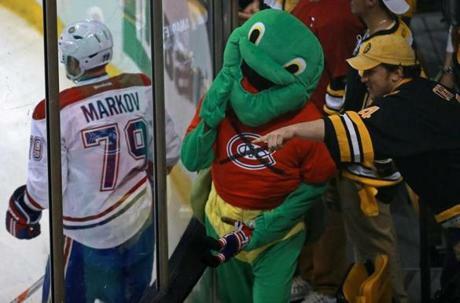 A Bruins fan dressed as a turtle and sweater with a crossed-out Canadiens logo tried to get the attention of Montreal players during warm-ups. 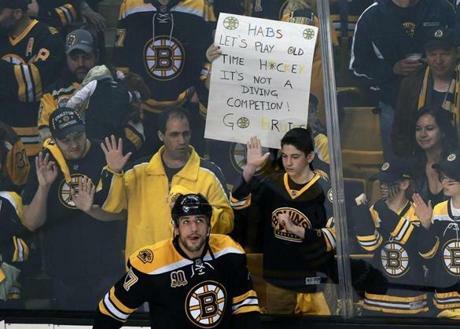 Milan Lucic captured during warm-ups, in front of a sign imploring Montreal not to do any "diving" during the game. Opposing goalies Tuukka Rask of the Bruins (left) and Carey Price of Montreal (right) got loose near each other during pre-game warm-ups. Montreal's P.K. 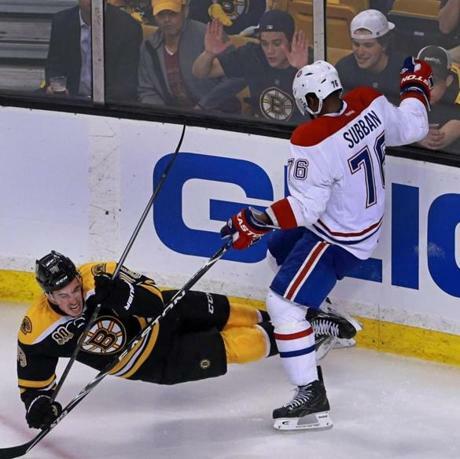 Subban sent the Bruins’ Reilly Smith to the ice with a first period hit. 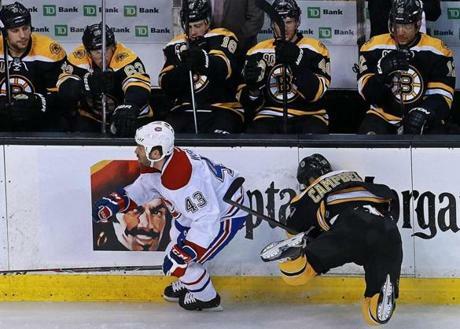 The Bruins Gregory Campbell missed a first period check attempt on Montreal's Mike Weaver, and ended up going face first into the boards. Montreal's P.K. Subban was lined up and looking to hit the Bruins Milan Lucic, but he never got the chance, as a collision with an official took him out of the play in the first period. 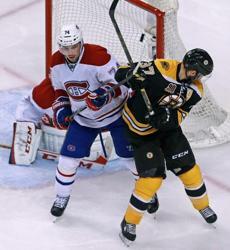 Montreal's Daniel Briere screened Bruins goaile Tuukka Rask as a first period shot by P.K. Subban (not pictured) got by him. Alexei Emelin and Patrice Bergeron battled in front of the net, but the puck was already sailing into the net as Reily Smith (not pictured) scored in the third period. The score was 2-1 Montreal. 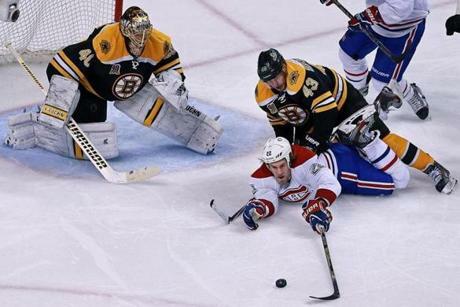 Montreal goalie Carey Price made a first-period save. 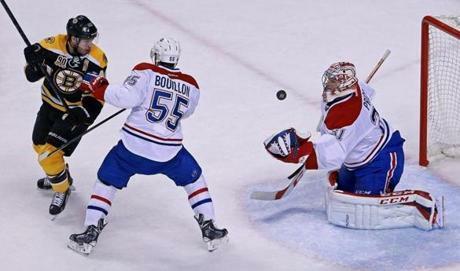 Montreal's Rene Bourque (17) beat Rask in the second period to put his team ahead 2-0. 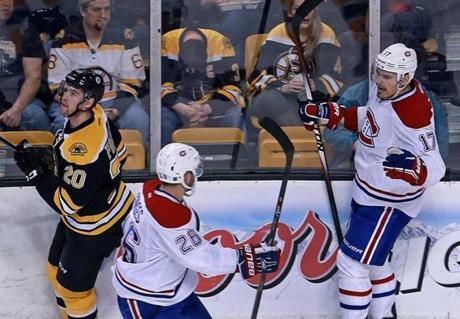 Bourque celebrated after he beat Rask in the second period to put his team ahead 2-0. Bourque celebrated with teammate Josh Gorges (26) after his second-period goal. Bruin David Krejci walked in all alone, but couldn't get the puck up high enough to beat Price in the second period. 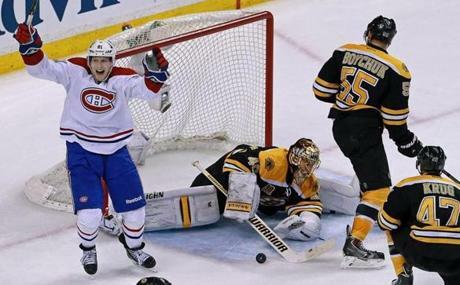 Montreal's Lars Eller celebrated after his team beat Tuukka Rask to go ahead 3-2 in the third period. The Bruins Loui Eriksson celebrated after Johnny Boychuk scored late in the third period to tie the game at 3-3. 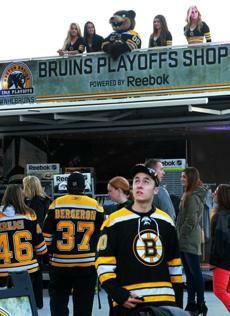 Boychuk and Brad Marchand were pumped after Boychuk scored late in the third period to tie the game at 3-3. The Bruins’ Zdeno Chara tried to redirect a flying puck past Price in the first overtime period, but couldn't connect. Bruin Daniel Paile got a two minute penalty for this trip of Montreal's Brendan Gallagher late in the first overtime period. Price made the save late in the third period as Reilly Smith (18) went horizontal in front of him, tangling with Josh Gorges (26). 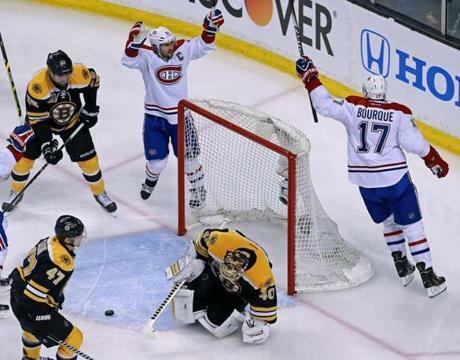 The Bruins’ Matt Bartkowski (43) took down the Canadiens’ Dale Weise in front of Tuukka Rask early in the second overtime. The penalty set up the game-winning power play goal soon after. The puck hit the back of the net on a shot by Montreal's P.K. Subban (not pictured) in the second overtime period. 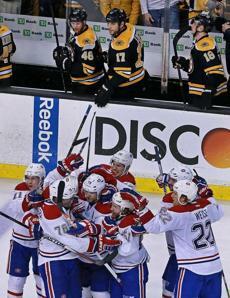 Subban and teammates Andrei Markov (79) and Rene Bourque (17) celebrated their 4-3 victory. 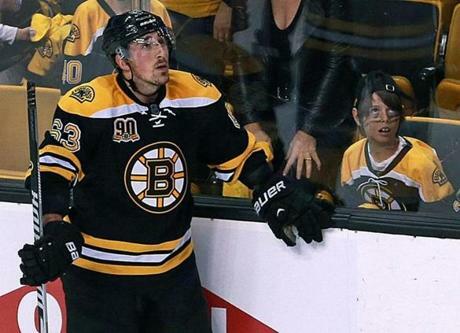 Brad Marchand and a young fan wore similar expressions as they watched the replay of the game-winning goal on the scoreboard.